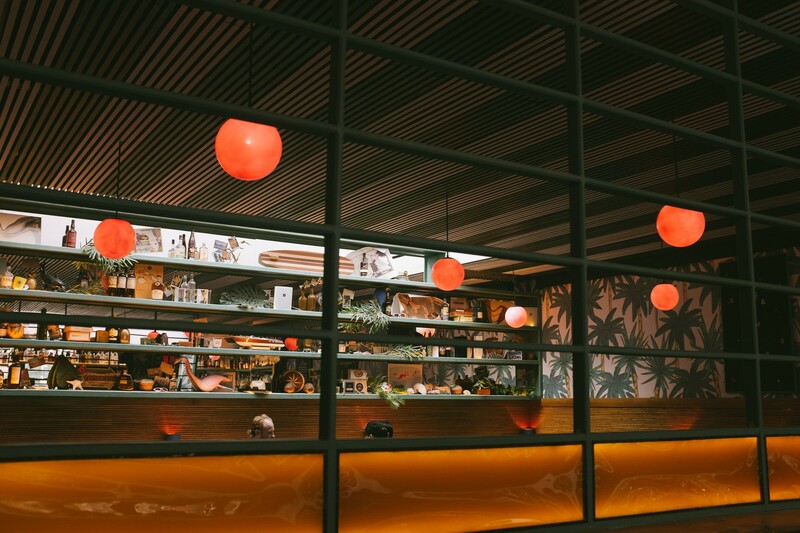 Whether you need a basement spot with tiki drinks or a craft beer bar that also serves coffee, use this guide to the best bars in the West Village. Our favorite cocktail bars are ones that take their food at least half as seriously as their vodka. The Happiest Hour falls into this category. Absolutely a cocktail bar first, restaurant second, The Happiest Hour is one of those rare hybrid bars that’s a one stop shop for those nights you just need to blow off some steam, get into some Action At The Bar, and still fill your belly with something delicious. The Happiest Hour took over the space that formally housed Kingswood, the popular Australian pretty people hang. Kingswood regulars won’t be disappointed, as Happiest Hour is an equally good time, and the food is better than Kingswood’s ever was. The space has a “tiki bar at the beach with pelicans in the water” kind of vibe - it’s the kind of spot where people could wear sunglasses inside, at night, and get away with it. We’re not saying you should actually wear sunglasses inside - you definitely shouldn’t. But if you insist, The Happiest Hour is the place to do it. After a couple cocktails, those rays will be coming down strong. The folks who own this place have been involved with such heavyweights as The Pegu Club, The NoMad, and Death & Co, so those drinks that are making the sun come out at 11pm, they’ve got some pedigree behind them. Speaking of strong, The Happiest Burger is a F-I-N-E bar burger. We’ll get into it below, but the burger here is worth a trip alone. One thing we don’t quite understand are the cheap-o Halloween nurse outfits they have the servers wearing. They kind of say, “I just got out of the hospital at Miami Dade, and I’m downstairs eating some Jell-O,” as opposed to, “I want to bring a heavenly drink and some great food.” Weird, unflattering, and awkward. About as appealing as a grown man with pierced ears. Nurse costumes aside, get The Happiest Hour on your radar for the next After Work Drinks or Girls’ Night Out occasion. For those times in your life when you just need a stiff drink and burger, The Happiest Hour is there for you. A double patty overflowing with American cheese, lettuce, tomato, pickles, confit onions, and special sauce, THIS IS ONE HAPPY, JUICY, BURGER. Just look at her, she’s beautiful. Go now, eat it. Deserving of their own food rundown listing. Skinny, crispy, salty, and magical. Worth it. A lightly fried bowl of salt & pepper broccoli with an aioli dipping sauce. Needs to be on your table. Their fried chicken is a little soggy, this one is a pass. Just order a bunch of vegetables and a burger instead. The kale salad is shockingly delicious. Super simple, but the dressing is great, and the shredded greens are a nice, healthy compliment to your burger. About as good as it gets. The specialty Link Ray and Fall From The Tree were among our favorites. They also make a mean old fashioned with rye and a delicious daiquiri with three different kinds of rum. You really can’t go wrong. We love Piccolo Angolo because it’s the antithesis of every other restaurant within walking distance. There is nothing cool or buzzworthy happening here, just really good, classic Italian food that will make you happy and probably very fat.